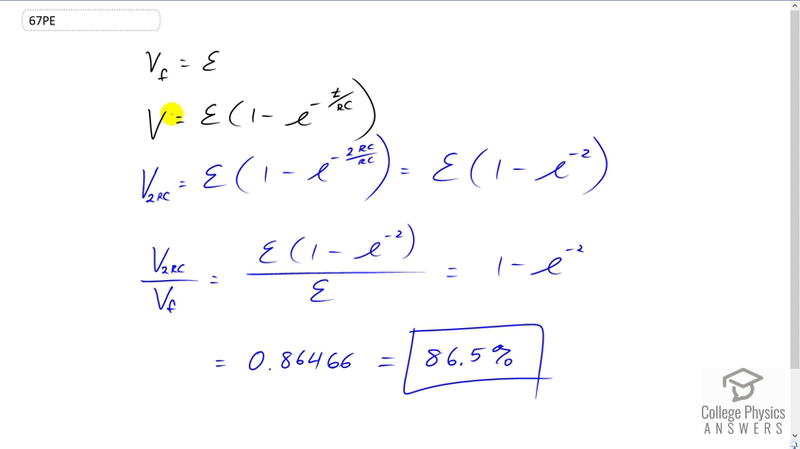 After two time constants, what percentage of the final voltage, emf, is on an initially uncharged capacitor $C$ , charged through a resistance $R$? This is College Physics Answers with Shaun Dychko. The question we’re answering here is to what percentage of the final voltage will the capacitor be charged after two times constants. So assuming that charging started completely discharged capacitor. We have the voltage will be the final EMF times one minus e to the power of negative the note of time passed divided by the time constant RC. And so the voltage when you have passed the time of two time constant, that’s two times RC will be EMF times one times e to the power of negative two RC which are substituting for the time divided by RC. And the RC is cancel. And this is going to make negative two for the exponent now. So when you divide that for the final maximum possible voltage which is the EMF, the EMF is cancel giving us one minus e to the negative two. And one minus e to the negative two is 86.5 percent.